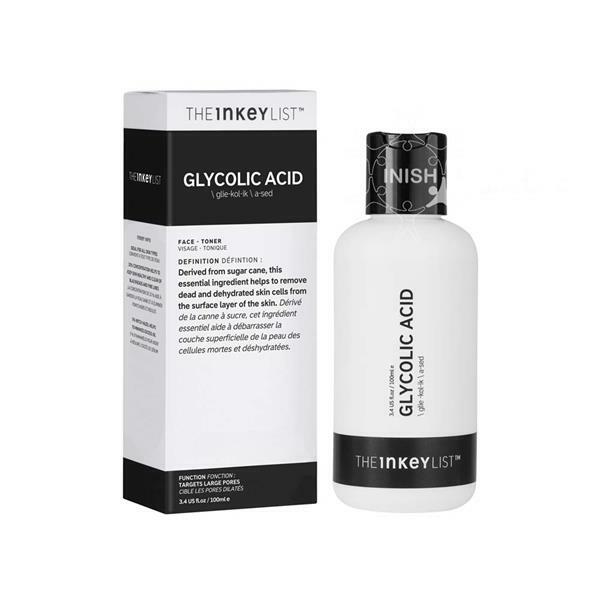 The Inkey List Glycolic Acid toner contains 10% glycolic acid which is an AHA naturally derived from sugar cane. It is used to gently exfoliate the skin minimising the appearance of pores and brightening the skin by removing dead, dull skin cells from the surface. It also encourages cell renewal and skin cells shed naturally to reveal a brighter and more even skin tone. The glycolic acid is accompanied with 5% witch hazel which helps to eliminate excess oil and therefore counteracting blemishes. Use in the PM. Saturate a cotton pad with the formula and, on cleansed skin, sweep across the face and neck. Do not rinse off. Follow with serums and moisturisers. Start with one application every other night and increase to once daily if desired. Glycolic Acid is an AHA (alpha hydroxy acid). AHA's can increase sun sensitivity due to their exfoliating properties. We recommend prior to sun exposure, covering areas where the product has been applied with sunscreen and for 7 days after use. Do not use if you have Rosacea. Avoid direct contact with eyes and lips. You may feel a slight tingling or hot sensation on the skin when applying, however, if irritation occurs and there is itching, or a prolonged burning sensation discontinue use immediately and consult a doctor. When combining with a Vitamin C serum - both are amazing ingredients that can help with healthy looking skin, however it would be best to use Vitamin C in the AM and Glycolic Acid in the PM. The acidic PH of both could lead to increased sensitivity and irritation if used together. Vitamin C works best in the AM due to its antioxidant properties. Using with a Retinol - if you are also using a Retinol product in your evening routine and want to add an acid we suggest using acids weekly or if you want to use your acid more regularly alternating with Retinol. If you do wish to use both on the same day, due to PH levels we would recommend waiting around 20 minutes before applying your Retinol and be careful of overuse as both increase skin renewal and may cause sensitivity. Using with other AHA's - we would recommend only using one AHA at a time (this includes Glycolic, Alpha Hydroxy and Lactic acid). Whilst they can have slightly different benefits over exfoliation can lead to increased sensitivity.